The crew of the yacht "Apostol Andrey". The idea of the sailing belongs to Nikolay Litau. Nikolay Litau and Arkady Gershuni were the managers of the yacht construction. 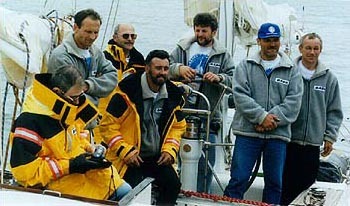 At the beginning of 1996 four new members were invited in the crew: Alexander Kireev, Igor Baldin, Vladimir Kireev and Victor Murashov, which actively took part in the construction. These six men and also Alexander Golubev, a physician, made the first crew of the yacht "Apostol Andrey". During different stages of the route the number of the crewmembers varied from five to seven people. Roman Smirnykh – in Pertropavlovsk-Kamchatsky, Sergey Pisarev and Konstantin Gramotnev – in Tiksy. Alexander A. Kireev, Second mate 40, Balashikha, Moscow region, yacht captain; (he was the captain of the yacht along the route Tver – Moscow – St.Petersburg). Konstantin V. Gramotnev, Seaman 44, Moscow; coastal skipper. 3-nd Circumnavigation of the yacht "Apostol Andrey"
2-nd Circumnavigation of the yacht "Apostol Andrey"